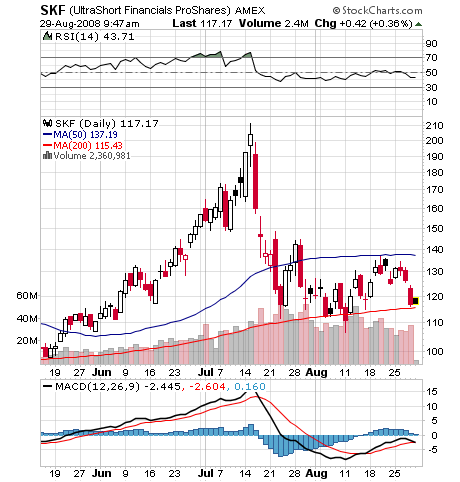 Many financial and bank stocks are showing bottoming continuation patterns. However, SKF, the inverse ETF that I use to short the sector, is at a key support level and may be good for a quick trade. The probability of the trade working is likely not better than 50 percent. However, risk is good. If entered here, around $116.50, stop could be placed around $114.50 (just under the 50 day ma). If your target is yesterday high at $123.50, that would give you a 3.5:1 reward to risk ratio.